A guest post by Yoram Barzel. By the time I arrived at the University of Washington in 1961, Doug had been there for a decade, and he stayed for two more. Moving from one Washington (the University of Washington in Seattle) to another Washington (Washington University in St. Louis) is confusing. Most people associate Doug’s career with Washington University in St. Louis, but it was in Seattle that he did the bulk of the work for which he won the Nobel Prize. His work is well known, and I focus on other aspects of his career and on personal memories. Doug got his PhD from Berkeley, and he was the first to admit that he hadn’t learned much there. Throughout his time in Seattle, when he needed advice when it came to economic analysis, he asked for it with great humility. Doug had a keen sense regarding which individuals to listen to, and it seems to me that this ability was a major contributor to his productiveness. The most prominent colleague to provide that advice was the late Don Gordon. Don is not well known, but he was great economist and the intellectual leader of the department. He cherished Doug’s great wisdom. Don persuaded Doug that the right way to do economic research was by testing hypotheses based on sound economic reasoning, and suggested to Doug to apply these in his economic history research; an almost revolutionary approach at the time. Equally revolutionary was Doug’s requirement of his doctoral students to acquire these tools. Doug and Don became close colleagues and intellectual allies and remained lifetime friends. A guest post by John V. C. Nye. A related version appears at Reason. Douglass Cecil North passed away at the age of 95 on Nov. 23, 2015 at his home in Michigan. Joint recipient of the 1993 Alfred Nobel Memorial Prize in Economics, he will be remembered for his path breaking contributions to the field of economic history and his central role in creating the New Institutional Economics. He spent most of his academic career at two institutions — the University of Washington in Seattle, and Washington University in St. Louis. For much of the last two decades, he also maintained an association with the Hoover Institution at Stanford University. Doug will be remembered for many things and others can go through his list of honors, awards, and accomplishments. But for me, two things will always stand out — his devotion to his students and his personal role in my life as mentor, colleague, and friend. 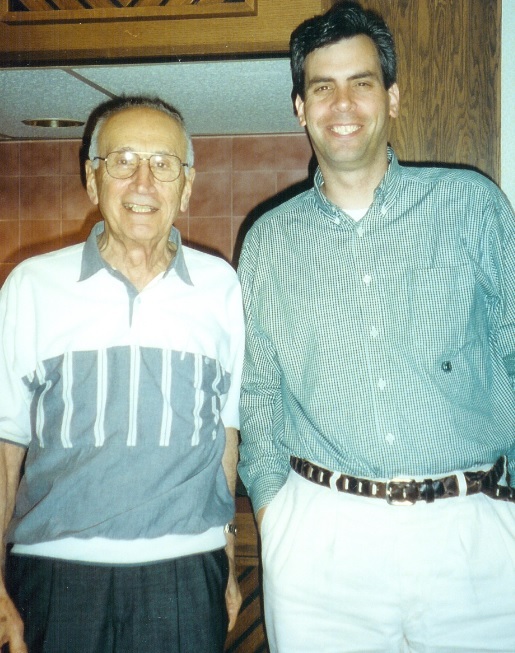 Alchian and me, circa 2000. Orley Ashenfelter asked Armen to write a book review of Oliver Williamson’s The Economic Institutions of Capitalism (such a brilliant title!). I got enlisted for that project too (Alchian and Woodward (1988)). Armen began writing, but I went back to reread Institutions of Capitalism. Armen gave me what he had written, and I was baffled. “Armen, this stuff isn’t in Williamson.” He asked, “Well, did he get it wrong?” I said, “No, it’s not that he got it wrong. These issues just aren’t there at all. You attribute these ideas to him, but they really come from our other paper.” And he said “Oh, well, don’t worry about that. Some historian will sort it out later. It’s a good place to promote these ideas, and they’ll get the right story eventually.” So, dear reader, now you know. This from someone who spent his life discussing the efficiencies of private property and property rights—to basically give ideas away in order to promote them? It was a good lesson.